Welcome to the Freeola Internet customer support pages. This is an article to help you point your domain name at your MobileMe hosting account. For more internet help topics please visit our main Support Page. Apple provide Mobile Me accounts so that you can sync your iPhone, Mac and PCs, part of the service they provide is a way in which to host websites made with iWeb (web publishing suite for Mac). If you have a domain name with Freeola that you wish to point towards your MobileMe website hosting with iWeb '08 or '09 then this guide will help you achieve that. Go to File and then Set Up Personal Domain on MobileMe. Log into your MobileMe account. Click the Add Domain... button. Enter and confirm your domain name in the appropriate fields and click Continue. Now open another web browser such as Safari and log into your MyFreeola account. Go to View/Edit Domain Details on the left hand menu. 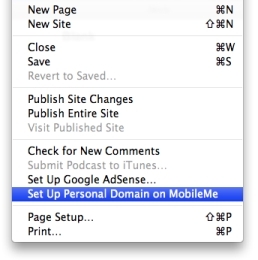 Tick the box next to the domain you wish to point at your MobileMe site and click Change DNS. 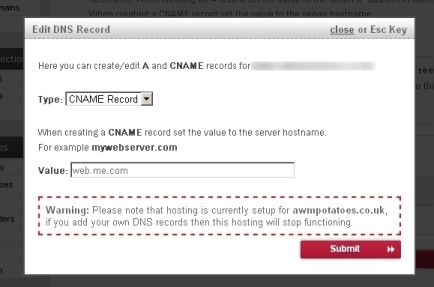 Select Create/Modify Custom Web DNS Records (Advanced) and click Continue. Click Continue again, then next to the www. record click Edit. Change Type to CNAME, then set the Value as web.me.com and click Submit. You will then be notified these changes will take place within the next hour. Back on the MobileMe site, click Done. You domain will now point towards your MobileMe hosting account.